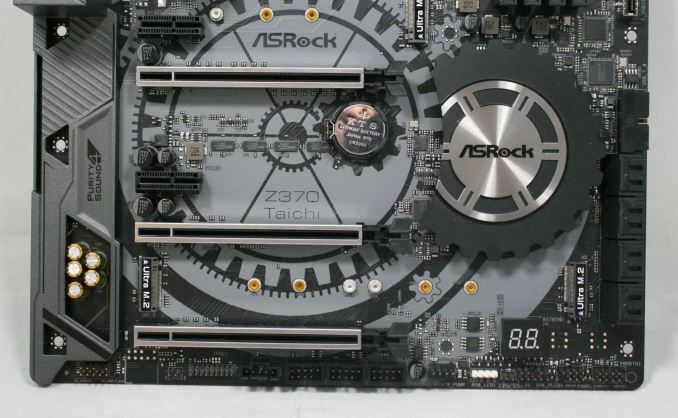 ASRock's Taichi motherboards have all had similar aesthetics since their inception a couple of generations ago. 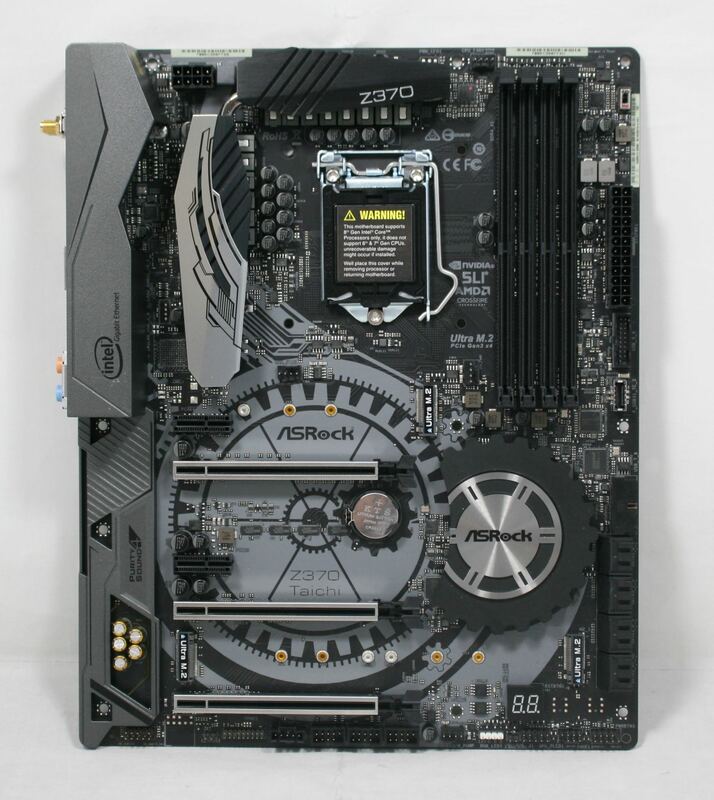 The underlying theme on these boards for appearance is pretty mechanical, with the black PCB having cog-like designs stenciled on the PCIe area with it carrying up to the power delivery heatsink as well as using a gear-shaped chipset heatsink as well. 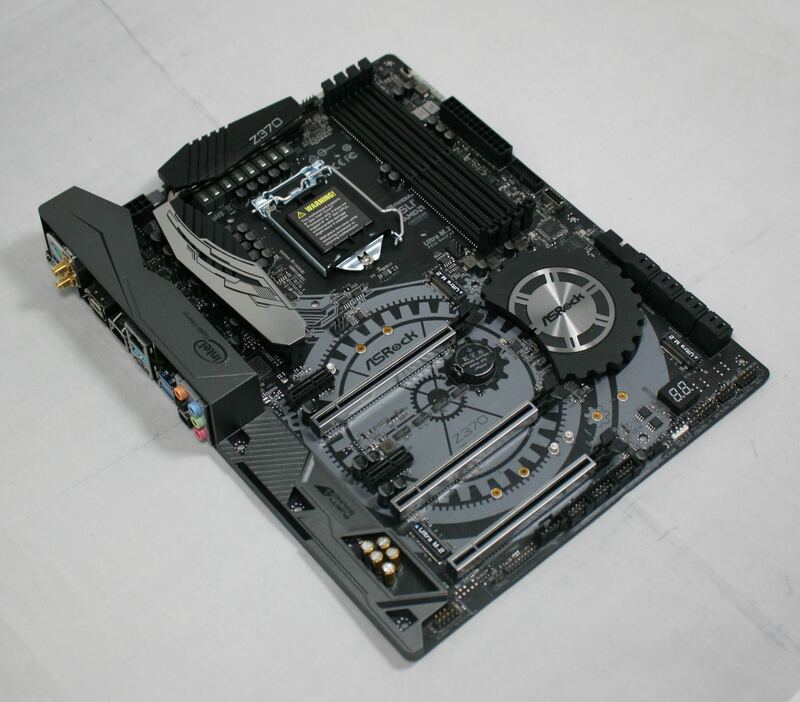 Outside of that, we are able to pick out four black DIMM slots, dual heatsinks connected via a heatpipe for the power delivery, thee full-length reinforced PCIe slots, as well as three M.2 slots can all be found on the board. Though it does not have 'gaming' or 'professional' in name, the board has enough features to make many users happy. It might not have some of the high-end features, such as 10G Ethernet or Thunderbolt 3, but that comes out through the pricing. You'll need to spend a bit more to get those. The Taichi, as in previous generations (we reviewed the X299 Taichi late last year), is not adorned with a lot of RGB LEDs. ASRock chose to go the understated route only adding a couple of them under the chipset heatsink. The board does include an RGB LED fan header (4-pin in white) located just below the debug LED on the bottom if the user needs more bling. Both the integrated and externally attached RGB LEDs are controlled through ASRock's RGB LED software. 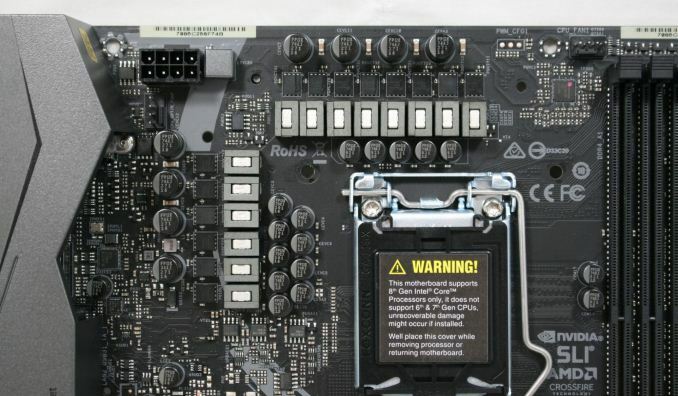 As far as fan headers go, the Z370 Taichi offers users a total of five in various locations on the board. Towards the top are a CPU fan and CPU Opt/WPump headers. Two chassis fan headers can be found mid-board to the left of the DRAM slots and just above the M2_3 slot above the top PCIe x1 slot while the last chassis fan/WPump header is located on the bottom of the board. Any header that doubles as WPump header is a hybrid and will be able to control both PWM and voltage controlled fans. The BIOS offers multiple options for setting fan control from CPU temperature to motherboard temperature along with hysteresis adjustments as well. 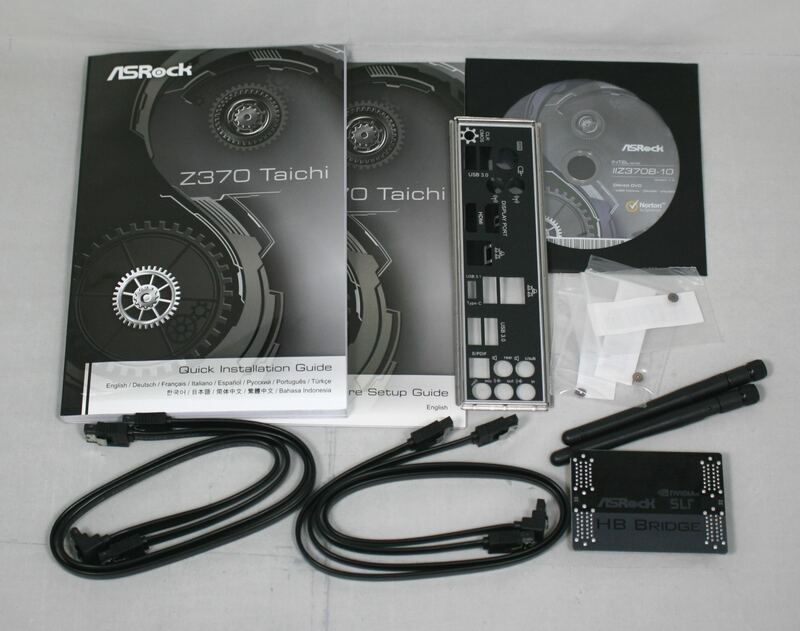 The power delivery on the Z370 Taichi uses an Intersil ISL69138 multi-phase controller capable of supporting seven phases on two rails. In this case, it is 5+2 with the CPU receiving five channels and the iGPU two. Complimenting the controller are 60A inductors along with Fairchild FDPC5030 dual N-channel MOSFETs rated for continuous 25A output. Each phase is doubled with two ISL6596 MOSFET drivers for VCore. In this implementation, each phase has its own driver. Either way it is sliced, the VRM should be plenty capable. The right side of the board shows us a few things from the debug LED on the left, to its eight SATA ports, two front panel USB 3.0 headers and USB 3.1 front panel header. Next to the 24-pin ATX power connector is an XMP switch allowing users to easily enable XMP settings through a hardware switch as opposed to setting it in the BIOS. 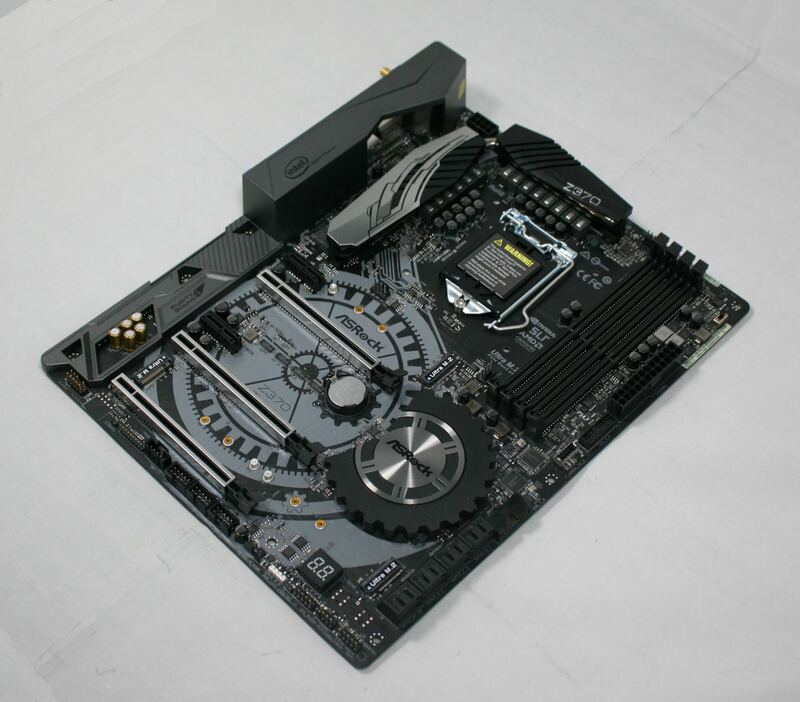 ASRock uses what they call Hyper DDR4 technology with an optimized trace design and memory circuit isolation in order to provide cleaner signals they say translates to better compatibility, stability, and performance. The closeup image above shows a total of eight SATA ports on the Taichi. Six are managed by the chipset and support RAID 0, 1, 5, and 10, while the others are supported through the ASMedia ASM1061 controller (no RAID support). The ASMedia ports are not affected by M.2 drives, however the chipset ports will. If M2_1 (bottom right on the board) is in use, SATA ports 0 and 1 will be disabled. If M2_2 (bottom left) is in use, SATA ports 4 and 5 will be disabled. If the third M2 slot (to the right of the top PCIe x1 slot) uses a SATA based module, SATA 3 will be disabled. Across the bottom of the board has a range of headers including front panel audio, Clear CMOS jumpers, a Thunderbolt AIC header, three USB 2.0 headers, 4-pin fan, RGB LED headers, and more. We are also able to get a clear shot of the debug LED while to the left of it are the dual BIOS chips. The bottom half of the board contains the Realtek ALC1220 chip under the shroud on the left, with its Gold series Nichicon Audio capacitors poking through. The audio section is isolated from the PCB. Not pictured here is the second amplifier, a Texas Instruments NE5532 that is mated to the HD Audio header. The Z370 Taichi has five PCIe slots with three full-length reinforced intended for video card use (CPU connected) while there are two other x1 slots (chipset connected) for other peripherals. The board supports both SLI (dual) and up to 3-Way Crossfire GPU configurations. The back panel IO has a full complement of ports and such from dual network ports, six USB ports, as well as the Wi-Fi, video outputs, and audio stack. The accessory stack includes what is needed to get started from SATA cables to guides and disks.